← French Navy to the Rescue! How about this patriotic pie for a Labor Day picnic ~ Especially easy for the cook who does not like to make crust! The colors of the berries, red raspberries from our garden, a topping of homemade whipped cream and local blueberries are U.S.A.patriotic! Nan’s Crustless, Almost-sugarless, Mixed Berry Pie – 20 minute active prep time plus cool down for hot ingredients! Red raspberries, blueberries and black raspberries to fill the pie plate to the top. Arrange strawberries flat on the bottom of a 9” plate. In a sauce pan over a medium fire add 2 cups of water, 1 box of cook and see vanilla pudding and cook as directed until bubbly and thickened. Then add one package of raspberry Jello. When it returns to a low boil while stirring, and thickens again, remove from flame and cool the glaze in an ice bath. While cooling, fill the rest of the pie plate with fresh blueberries, red raspberries, and black raspberries. 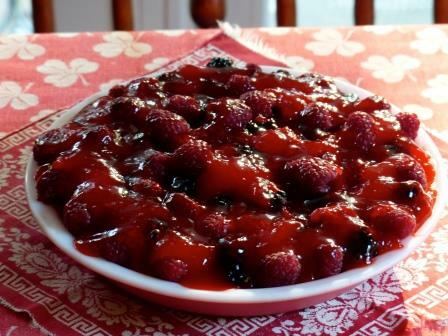 Pour the glaze mixture evenly over the berries. Place in the fridge at least a four hours to set; overnight is best. Serve with whipped cream to cover each individual piece so as to show off the festive colors of the pie before cutting it.